Best remembered as straight-forward female vocalist for Benny Goodman from 1937 to 1939 who sang on the record "And The Angels Sing"
Swinging performances with Goodman included "Loch Lomond" at Carnegie Hall in 1938 and from 1937; "Bob White" and "Bie Mir Bist Du Schoen"
Martha Tilton is best known in music circles for her years spent with Benny Goodman�s big band. Her first recording session took place with the Goodman Orchestra in September of 1937. She left the Goodman aggregation in 1939. Ms. Tilton was born in Texas and lived for a short time in Kansas. When she was 7 her family relocated to Los Angeles where her father was a banker. She began singing for free on a small radio station in Los Angeles while attending Fairfax High School. An agent heard her, signed her and began booking her on larger radio stations. Tilton dropped out of high school in the 11th grade to join Hal Grayson's band. She was part of a vocal group, Three Hits and a Miss, when she was asked to audition for the Goodman band. Mr. Goodman left the room during her second song, so she left too, disappointed that he was not impressed. She later learned that he had liked her, and was hired for $125 a week in 1937. Dubbed �liltin� Martha Tilton during her tenure with Goodman, Ms. Tilton had girl next-door looks and a personality to match. 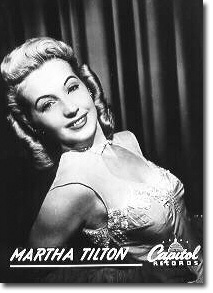 Coupled with her straight forward and no frills vocals, Tilton was received warmly by both the media and the all-important public during the Swing era. She recorded a number of fine sides for Goodman and toured with him regularly from 1937 to 1939. Although her most popular recording with Goodman was �And The Angels Sing� her first session with the bandleader produced a recording of �Bob White� (What �Cha Gonna Swing Tonight) that has a little more zip to it. However, her short vocal on a Goodman Quartet recording of �Bie Mir Bist Du Schoen� was her greatest Goodman jazz record. Although many jazz discographies do not list the session, the recording was waxed in December of 1937 in two parts, taking up 2 sides of a 78-RPM record. Trumpeter Ziggy Elman was added to the Quartet on side 2 along with Tilton�s vocal. During Tilton's time as vocalist with Goodman, the band made history when it performed the first-ever swing concert at Carnegie Hall in 1938. In so doing Martha Tilton became the first non-classical vocalist to perform at Carnegie, known mainly at the time as a classical music venue. Tilton joined Artie Shaw�s big band in 1940 recording two less than memorable sides and then recorded with Bob Crosby�s Orchestra in 1941. Tilton made guest appearances on numerous radio programs in the '40s and was vocalist for a time with the Billy Mills orchestra on "Fibber McGee and Molly." She also was the host of her own radio show for NBC, "Liltin' Martha Tilton Time," for a year. During the World War II years, Tilton participated in two USO tours with Jack Benny � to the South Pacific in 1944 and the next year to Germany to entertain Allied troops right after the war ended in 1945. She also had major success from 1942-49 as one of the first artists to record for Capitol Records. Among her biggest hits as a solo artist were "I'll Walk Alone," a wartime ballad which peaked at #4 on the charts in 1944; "I Should Care" and "A Stranger in Town," both of which peaked at #10 in 1945; and three in 1947: "How Are Things in Glocca Morra," from Finian's Rainbow, which reached #8; "That's My Desire," which hit #10; and "I Wonder, I Wonder, I Wonder," which peaked at #9. After she left Capitol, Tilton recorded for various other labels, including Coral and Tops. Among her later albums was We Sing the Old Songs (1957, Tops), a mix of older songs and recent standards with Curt Massey, who later became well-known for singing the theme song to the CBS-TV series Petticoat Junction. Martha Tilton made her movie debut the same year she made her first recording with Goodman in 1937. The film was "Sing While You're Able" and she had memorable performances in other movies such as "Sunny" (1941), "Swing Hostess" (1944), "Crime, Inc." (1945) and "The Benny Goodman Story" (1955). Her singing voice was also used in many films dubbed over other actresses including Barbara Stanwyck, Martha O'Driscoll, and Anne Gwynne. Tilton who later appeared in a daily half-hour TV show with the aforementioned Curt Massey that ran almost seven years in Los Angeles, continued to work through the mid-1960s. In the mid-1980s, Tilton came out of retirement to be the featured vocalist on a Benny Goodman tribute band's tour of Australia. Chuck Cecil, longtime host of the Los Angeles-area radio show "The Swingin' Years," told The LA Times in December of 2006, "To me, she was so unique because she didn't reinterpret the song that the composers gave her; she sang it straight, without her own styling or imprint on it�"
In his review of "The Liltin' Miss Tilton," a two-CD set from Capitol Records in 2000, critic Don Heckman wrote: "There are those who would say that Martha Tilton wasn't a jazz singer at all. But Swing era fans won't have any doubts, remembering her for a rocking version of 'Loch Lomond' at Benny Goodman's 1938 Carnegie Hall concert." Martha Tilton died December 8th 2006 in Los Angeles. She was 91. Tenor man Illinois Jacquet got his big start with Lionel Hampton during the Swing era. He went on to star at Jazz At The Philharmonic concerts and lead his own bands into the 1990s.